Part of the raceme of small-flowered lupine. Photographed at Memaloose in the central Columbia River Gorge........April 24, 2006. The photo at right shows a typical lupine leaf, which is palmately compound. 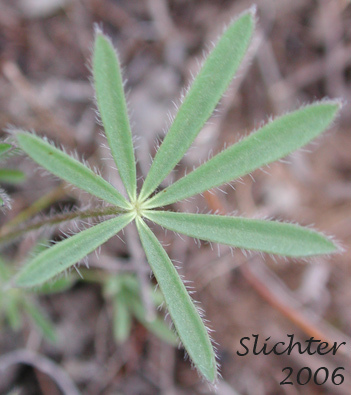 This particular leaf is from small-flowered lupine (Lupinus microphyllus). This list is approximate. The scientific names have changed for many of the lupines on this list, with Washington botanists adopting nomenclature different from those in Oregon, so where possible, synonyms have been listed. Longspur Lupine, Spur Lupine, Spurred Lupine: Lupinus arbustus (Synonyms: Lupinus amabilis, Lupinus arbustus ssp. arbustus, Lupinus arbustus ssp. arbustus var. arbustus, Lupinus arbustus ssp. arbustus var. montanus, Lupinus arbustus ssp. calcaratus, Lupinus arbustus ssp. neolaxiflorus, Lupinus arbustus ssp. pseudoparviflorus, Lupinus arbustus ssp. silvicola, Lupinus arbustus var. montanus, Lupinus argenteus ssp. argenteus var. laxiflorus, Lupinus argenteus var. laxiflorus, Lupinus caudatus, Lupinus caudatus var. submanes, Lupinus caudatus var. subtenellus, Lupinus laxiflorus, Lupinus laxiflorus ssp. laxiflorus, Lupinus laxiflorus var. calcaratus, Lupinus laxiflorus var. cognatus, Lupinus laxiflorus var. elmerianus, Lupinus laxiflorus var. laxiflorus, Lupinus laxiflorus var. lyleianus, Lupinus laxiflorus var. pseudoparviflorus, Lupinus laxiflorus var. silvicola, Lupinus lyleianus, Lupinus mucronulatus var. umatillensis, Lupinus sulphureus var. applegatianus) - Wildflower to three feet high. Leaves compound-palmate (like palm fronds). Flowers blue to purple, claw shaped, with a definite spur or pointed bump at the back of the flower. Flower stems are above the leaves in racemes (flowers come out of stem on all sides). 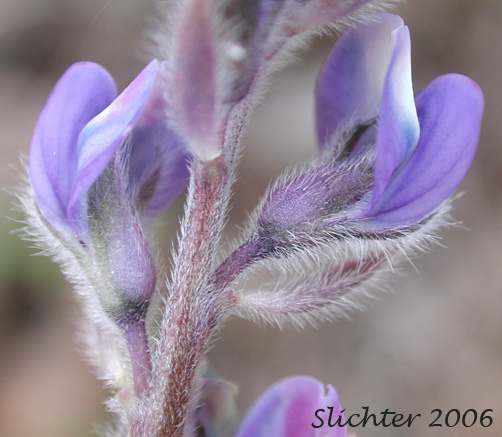 Kellogg's Spurred Lupine: Lupinus argenteus var. heteranthus (L. caudatus) - ?????? Common Broad-leaf Lupine: Lupinus latifolius var. latifolius - Wildflower to four feet tall. Leaves compound-palmate (like palm fronds). Flowers blue to bluish-purple, often with a white patch at the base of the upper petals. Flowers irregular with a crab claw-like appearance. Flower stems are above the leaves in racemes (flowers come out of stem on all sides). Large-leaf Lupine: Lupinus polyphyllus - Wildflower to 4 feet tall. Leaves compound-palmate (like palm fronds). Flowers are blue to bluish-purple, claw-shaped, found above the leaves in racemes (flowers come out of stem on all sides). Hybrid Lupine: Lupinus leucophyllus x sericeus ? - Help identify this lupine from the Oregon side of the Columbia River, east of the Deschutes River.